Why did a hotel security officer set hotel fires? It sounds like the beginning of a bad joke, except, unfortunately for everyone involved, this was no joke. When you hear about a former employee of two hotels starting his own hotel fires, you might assume he or she did so because of job dissatisfaction or revenge. But in the case of Mariano Barbosa, Jr., the suspect simply wanted to make his job a little bit easier. Barbosa was the security officer for both Yotel and the Soho Grand Hotel in Manhattan. He recently was arrested and charged with setting multiple hotel fires in both of these hotels dating back as far as 2009. When fire marshals began to grow suspicious of Barbosa’s inconsistent stories, they questioned Barbosa further. As the nation reflects on the events of 12 years ago, so do we at Gadling. While construction is not yet finished on the new One World Trade Center, this photo from Flickr member Karl Norling (taken on June 22) shows some of the most recent progress. 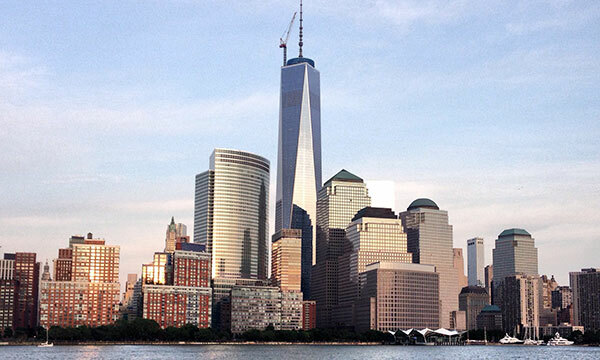 The tower will eventually stand 1,776 feet tall and be America’s tallest building. Where did you go for your Labor Day weekend travels? I ended up in New York City, after a particularly early morning jaunt to Morristown, Union City and Hoboken in New Jersey — all in the name of an old BMW. Three of us crashed at my old college roommate’s place on Saturday night. Waking up to the sprawl of Hoboken and the Manhattan skyline, seen from his Union City apartment’s balcony, was a really neat view. Sometimes an “only in New York” moment has a more global story. On a rainy afternoon this week in Manhattan, my friend visiting from Germany was excited to spot a Mercedes with Munich plates. The car had a distinctive pattern covering its exterior, we debated whether it was metal, fabric or beads, but the actual decoration is much sweeter: gummy bears. The back window detailed the “grand tour” of this visionary art, starting in Munich, traveling to Paris and London, and finally New York. The project is the third installment of artist Guenther Siraky‘s Mercedes Trilogy, which also took him and the car through Europe in 2007. The plan was to take the gummy bear car to each of the city’s major art museums, including the Louvre, Tate and Guggenheim, exhibiting the work of art in front of each museum. Over a million people have seen the car, and reactions range from disbelief and amazement to tears of joy. NYPD officers have even allowed him to park in forbidden places to display his work. While the car should be covered in rain and extreme heat, the slightly melted gummy bears just add to the vehicle’s charm. Siraky intended to sell the vehicle once he completed his tour last month, but he has extended his time in New York, and can be found driving it all over the five boroughs through the end of September. See a slideshow of the gummy bear car in NYC below, and check in with the art car’s adventures through the artist’s Facebook page. Thursdays mark a new rendition of our Photo of the Day on Gadling. We’ll be traveling back in time to feature interesting memories of years past. We’re reaching far back in the archives this week. Countless people have walked down, driven on, or worked near Broadway in New York City. Ever stop to think what Broadway looked like, over 150 years ago? Now you don’t have to. Enjoy this photograph from (roughly) 1855.